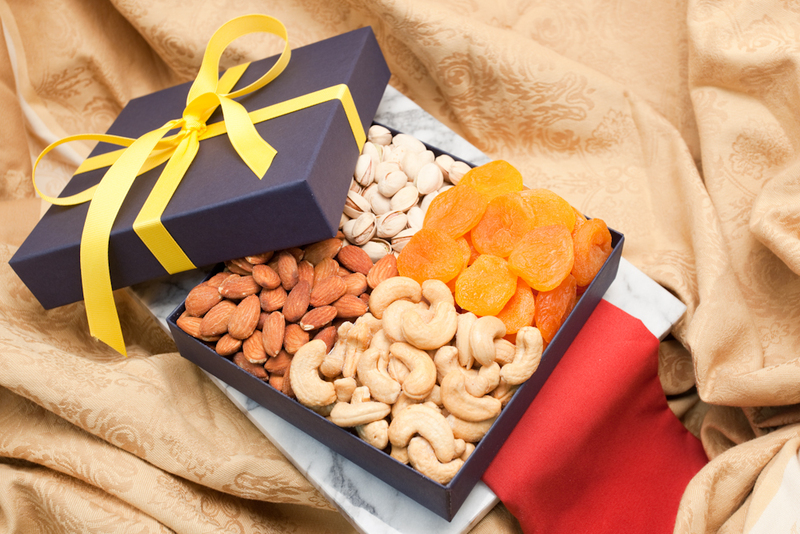 Our Nut and Fruit Quattro Gift Box has a perfect assortment of our Giant Whole Cashews, Jumbo California Almonds, Colossal California Pistachios and Jumbo Turkish Apricots. 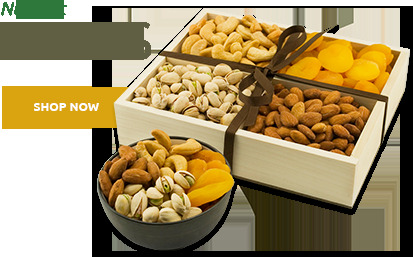 Fruit and Nut Quattro Gift Box - Net wt. 24 oz. 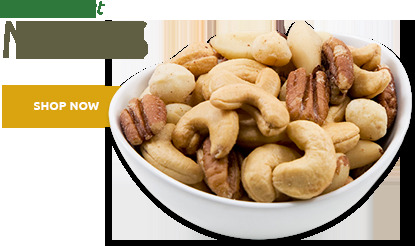 Cashews, Almonds, Pistachios, Apricots, Peanut and/or Cottonseed Oil, salt, Sulphur Dioxide. 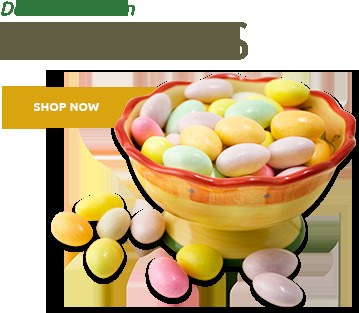 Great quality, healthy alternative to other edible gifts. 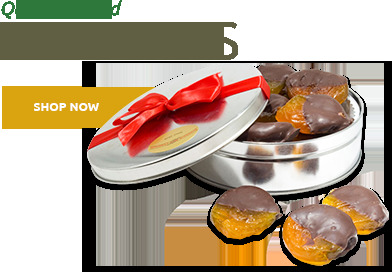 Great quality dried apricots and nuts. Huge cashews and it all tasted very fresh. I wish there had been some way to know what the color box and ribbon would be... we got 20 and they were all a navy blue box (actually what I was hoping for) but pink ribbon. It's a good looking combination, but I went out and got some blue and silver ribbon for most of the boxes, as this presentation was better for the customers they we're being given to. There was some bright green crinkled paper decoration on the inside -nice, and each item (apricots, pistachios, cashews, almonds) was individually wrapped. They arrived early and were well packaged, and can be easily shipped in the boxes each box is shipped in. They are lightly salted, not too much oil/salt added. I called customer service because the company/quantity discount they offered online did not work, they promptly gave me another and I got what I wanted. Purchased as a gift and it was a hit. They said everything tasted great and was very fresh. This is a great alternative to buying flowers or something that just sits around. Very timely delivery, all nuts and fruit were fresh. A gift for my mother and she loved it! Perfect birthday greeting for a health-conscious college student. 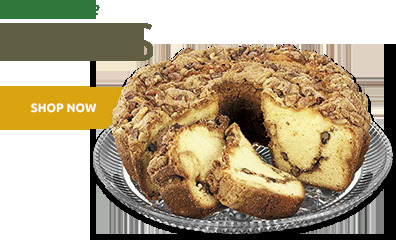 Great guilt-free alternative to birthday cakes and cookies. ProsShipped FREE and on time. Recipient was pleased with freshness and presentation.